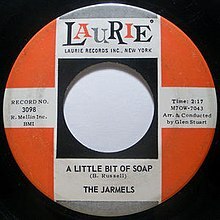 "A Little Bit of Soap", written by Bert Berns (aka Bert Russell), was a song, first sung in a bluesy soul style by the Jarmels, who reached number 12 with it in September 1961 and number 7 on the R&B charts. "A Little Bit of Soap"
"The Way You Look Tonight (Swing Time)"
The song has been covered many times since. Garnet Mimms' 1965 version charted at 95 on the Billboard Hot 100. The Exciters' version charted at number 58 on the Billboard Hot 100 in February 1966. Paul Davis's rendition reached number 52 on the Billboard Hot 100 in the summer of 1970, while Nigel Olsson's version hit number 34 on the Billboard Hot 100 and number 9 on the adult contemporary chart in June 1979. Both Davis and Olsson used ballad arrangements. The song was a success in Britain in the 1978 version by Showaddywaddy, peaking at number 5 in UK Singles Chart in July 1978. While the song was a minor hit in the United States all three times it was released, it reached the Top Ten on the Canadian charts, and Top Twenty in Australia in 1970 for Davis. It was his first charting single release. "A Little Bit of Soap" was a huge hit in southeast Asia when the Hong Kong-based group Cliff Foenander and the Fabulous Echoes released it as a single. It spent 25 weeks at number 1 in top ten charts in 1963 in southeast Asia. Foenander and the Fabulous Echoes also sang the hit in Las Vegas, USA, in 1964. It made Cliff Foenander a household name in South Asia: Radio Ceylon, the oldest radio station in South Asia, played the number one hit across the Indian subcontinent. Daniel Johnston also covered it, while De La Soul sampled it for a different song with the same name. ^ Nigel Olsson, "Little Bit of Soap" chart position Retrieved June 19, 2016. ^ a b "Remembering Cliff Foenander of the Fabulous Echoes". worldmusiccentral.org. November 10, 2007. Archived from the original on 2008-09-21.